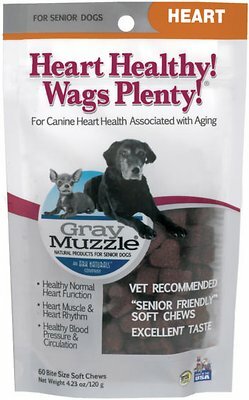 Gray Muzzle's Heart Healthy! Wags Plenty! Treats are designed to help improve heart function in aging dogs. 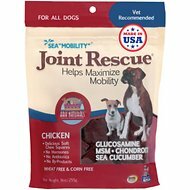 They use a proprietary blend of vitamins and minerals that has been shown to improve blood pressure and circulation in senior dogs. Active Ingredients: Taurine, Acetyl-L-Carnitine, Dandelionextract, Hawthorne Berry Extract, Bilberryextract, Egg Albumin, Coenzyme Q10 (325 mg ). Ark Naturals' Gray Muzzle line of pet products is specially formulated for senior cats and dogs. The supplements, shampoos, treats and dental chews are specially made to address your best friend's evolving needs as he matures. Each wholesome formula is 100% made in the USA and contains potent, human grade ingredients for solutions that are effective and gentle for seniors. Gray Muzzle senior dog treats include ingredients like gingko biloba to help with memory and dandelion extract to support heart health. Plus, Ark Naturals Gray Muzzle No Shampoo! Shampoo for Dogs & Cats is a waterless, no-rinse, foaming shampoo that offers a stress-free way to get older pets clean. Worried about grain free dog food/ heart failure from low taurine? These supplements have the taurine your dog needs. They are tasty, too! Until the government dictates the taurine content of dogs be raised, ( like they did for cats, years ago), supplement with these if you feed grain free dog food. (My dog is highly allergic to corn, rice, and wheat), there are not a lot of choices. I had a cat die years ago from low taurine in his diet, heart problems. For her, these are a must, and she loves them! Good healthy treat for our chihuahua with heart disease. Other treats are more palatable/exciting to him but he likes this and they're good for him. A bit pricey though for a tiny bag. They are very tiny pieces so my dogs gulp them down quickly. Don't really know what to say about the effects on their heart health. These are excellent treats for a dog with a heart condition. Good ingredients. Great for my 15 year old Dachshund! My Pom has Mitral Valve and some enlargement of her heart. ALL the ingredients in this easy soft chew has them. She has been on them 8 days. She loves them. I love not having to buy each supplement and trying tot get them down her. Excellent product!!!! I was recommended on a Congest Heart failure group and I recommend theme with no doubt they help. My doxie is 15 and she needs all the help she can get to keep her healthy. I discussed these with my vet and he was not concerned about her eating these soft treats. After all, she only has 1 tooth. And she is picky...happy to have found them and she likes them. Years ago, we started a limited ingredient diet, because the newest member of the family was often itchy, and always had an upset tummy. Although I'm not able to vouch for the medicinal benefit of adding a taurine supplement, I figure it can't hurt if your dog is on a grain-free diet. My little buddy likes the treats, and he has no side-effects. My dog was diagnosed with a heart murmur a year ago. I switched to raw diet Steve’s and primal and goats milk and these treats and her condition has not gotten any worse so far. Sally is 10 years young. She loves these treats. I will buy more.